Ever been sunburned? Gone to bed with that awful, sweaty, stinging feeling of hot regret? Had little blisters form then pop? We pretty much all have haven’t we. Stupid bastards that we are! “Stupid” because that ol’ friend of ours, our nearest star, our planet’s parent and orbital centre, The Sun, puts out a lot of energy. Just how much; well obviously enough to broil your shoulders at some point! Got that? Clearly though this formula doesn’t account for the various ways that the Earth’s atmosphere absorbs and scatters the energy as it travels from the outer edge of the atmosphere to ground level. That varies depending on cloud cover and other suspended moisture, suspended particulates, vegetation and so on. So lets just sum it all up and say that the sun puts out a lot of energy and on a hot, clear day you could fry an egg very, very quickly using just the sun’s heat. 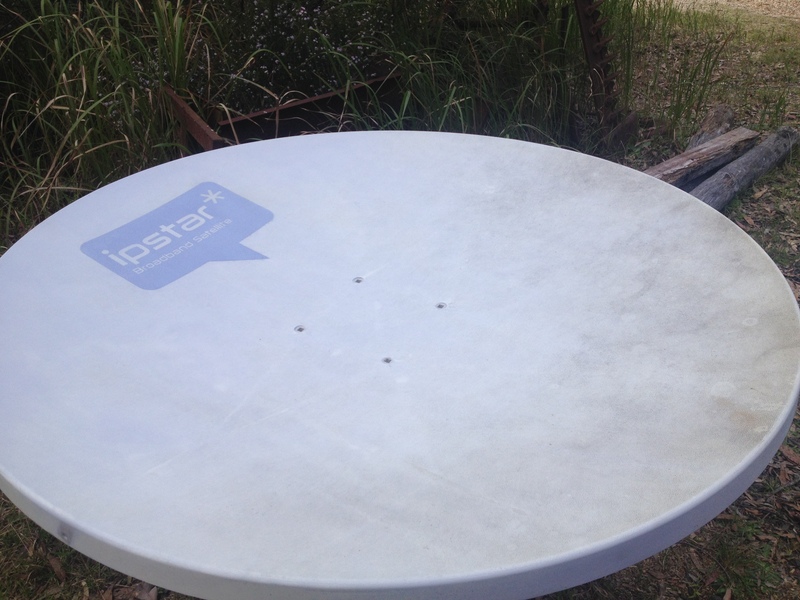 Which brings us to this little conundrum; what do you do with an old satellite (internet) dish that has been superseded with a newer, faster model? Give it to the dish-installer man to take away and dispose of? Turn it into a very large birdbath? Use it to make mischief (in a fun, harmless way of course)? Guess which numbered box the money is in….you betcha….Number 4! 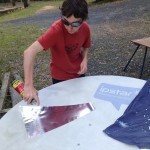 There are quite a few YouTube videos of people making reflector dishes out of old sat’ dishes. Many of them use the little, square mirrors, like off a disco mirror ball. All I can say is that they must be richer than me, or at least more willing to throw money at a simple, fun project. At the cheapest price I could find those mirror squares for sale the total cost for enough of them would have been $400-$500. No way José!! Reflective Mylar film is another matter – a roll of that comes in about $40-$50. 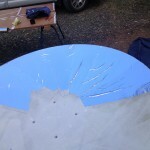 The overall reflective properties probably aren’t quite as good as a set of glass mirrors (Mylar film comes in at about 92-97% reflectivity, not too different than mirrors as the actual reflective material in a mirror is basically the same stuff; however the Mylar film is impossible to adhere to the dish without some imperfections resulting, such as ripples, bubbles and some areas of glue overspray) and of course the film won’t be weatherproof so the dish will have to be stored indoors. However these cons just pale into insignificance against the cost savings. 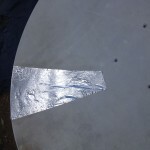 The film was cut into (roughly) triangular shapes to allow us to better shape it into the dish. 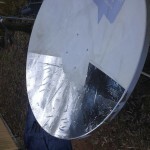 To glue the film to the dish we used a spray adhesive, masking off each previously glued section to prevent (OK…minimise) overspray. 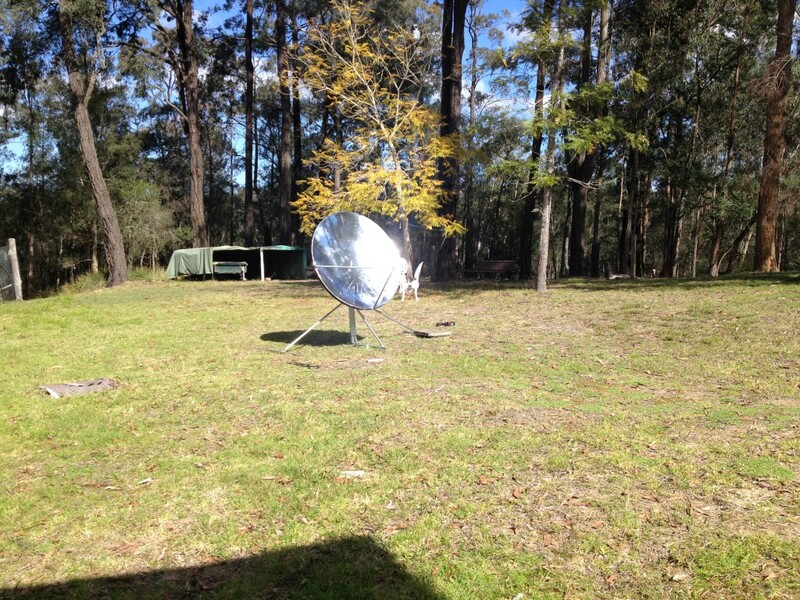 Here is the completed dish, mounted on the post, leg spars and roof brackets that were intended to actually put the original dish on a roof, and are here slightly modified to provide a stable, free-standing base. More mayhem….errrr….I mean “Scientific Experiments of an Educational Nature” videos to come. The video above was our first “experiment” which was performed at around 2:30pm mid September. Can’t wait for mid-Summer at between 11am and 1pm (solar time). Warning – try this at home. 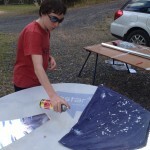 This entry was posted in Jobs done and things built, Practical stuff, Video by Simonperry. Bookmark the permalink. Ha! dont stand in front of bad boy! OMG.. sun tan would be the least of your worries!